The defense sector is looking for ways to extend its reach and capabilities, with underwater robotic and autonomous systems and sensors. Extending the capabilities of submarine warfare systems without the need for humans is a key focus in the marine defense space. Navies feel under threat; they have limited budgets and worries about resurgent maritime forces from Russia and China, while new technologies – robotics, artificial intelligence (AI) and autonomous systems – are increasingly available to an ever-wider range of players, creating what are termed asymmetric threats in an ever-wider battle space. Marine autonomous systems (MAS), including AUVs, unmanned underwater vehicles (UUVs) and or “off-board” sensors are part of the solution, to extend the reach of existing systems and, longer term, potentially replace them, alongside better knowledge and use of the oceans (understanding the ocean environment to make strategic use of it) and data. One focus area is larger unmanned underwater vehicles, which are likely to host payloads that include everything from forward supplies to smaller unmanned and or autonomous vehicles. While currently mostly used for ASW training, such as the UK’s MSubs’ 24m-long Mobile Anti-Submarine Training Target (MASTT) XL UUV, the view of many is that this process will lead towards using these systems operationally in the future. The Dutch government, for example, has assessed use of larger unmanned vehicles to replace its manned, diesel-electric submarines, which are due for renewal in 2027. However, according to a joint paper presented by TNO Defense, Safety and Security, presented at UDT by Jan Bruggeman, the technology will not be ready in time, because it would be smaller and limited in firepower and range, is unlikely to have the required level of artificial intelligence by then, and that the algorithms required to deliver the level of autonomy needed would be costly and complex. More progress has been made in the AUV space and, according to Westwood Global Energy, global AUV demand will increase 37% between 2018-2022, with the military sector accounting for 70 percent of that demand. Nick Sheppard, Technical Director, Maritime Mission Systems, at Thales, and a UDT session moderator, says the AUV has been around and been quite successful for a number of years and is now a common tool in mine counter measures (MCM). But, he says that the potential to do much more than this was highlighted by Operation Unmanned Warrior in 2016, which showed navies that, when used in cooperation, maritime autonomous platforms could create a modular and extendable defense system. Operation Unmanned Warrior also showed the defense sector that it could learn from commercial and scientific AUV technology, says Shepherd, where range, loitering time, swarm operations, autonomous behavior capability and connectivity via surface vessels and satellite are being developed and extended. Chris Lade, Defense Sales Manager at Saab, agrees: “More and more of the commercial world is spending time under the water and doing some clever stuff,” – and in conditions as harsh as any defense environment. Saab already has strong links with the defense sector, through the main Saab business in Sweden, while its U.K. based outfit Saab Seaeye has a bigger footprint in the commercial space, with electric remote operated vehicles (ROVs) and AUVs. However, since 2007, when Seaeye joined Saab, the two companies have been leveraging each other’s expertise to build more cost-effective defense capable units, Lade told UDT, by drawing on its commercial systems, as well as more sophisticated commercial units, by drawing on its defense capability. This resulted in the Sabertooth, which adopted aft thrusters from a military Double Eagle MkIII vehicle, and the Subrov, a military vehicle built with commercial components, says Lade. New vehicles, also sharing capabilities between commercial and defense are being assessed, says Lade, including a tethered Sabertooth Survey Vehicle, which would have higher power than existing Sabertooths by using Double Eagle MKIII thrusters, and a Sarov Long Range, which would create a military Sarov with longer range by putting Sarov thrusters on a Sabertooth. Saab is also working with the Swedish Navy on MCM technology. The Swedish Armed Forces’ Area Search Unit has Remus 100, Seabotix LBV150 and towed sonar from CMAX in its fleet, says Rasmus Andersson, Chief of the Area Search Unit. Earlier this year, it put Saab’s Sea Wasp MCM robot to the test. Sea Wasp, at 1.7m-long, 0.05m-wide, 0.04m tall, weighs 9kg, was developed to find and then neutralize mines in harbor environments and around ships’ hulls. It can work in 2.5knot of current and has <60m operating ability, with support from just a generator, for power (or ship’s power), a pilot control station and a winch, says Andersson. Its station keeping mode works in relative and global modes and the vehicle can navigate itself to way points. Sea Wasp comes with a “very competent” electric gripping arm, although Andersson says he would almost prefer to have two arms, to be able to pull things apart. Sea Wasp also has two high-resolution cameras supported by lighting. In tests, in -10 degrees C in Sweden, a Sea Wasp placed a 10gm plastic explosive with magnesium core on a steel plate accurately, then detonated it and relocated itself after the blast, having not suffered any damage. While new platforms continue to be developed, what they can carry is also being extended. SEA’s KraitArray is a towed sensor for smaller platforms, including autonomous surface vessels, AUVs and small surface vessels that cannot tow a full-sized towed sonar array. The 16mm diameter KraitArray is a low profile miniaturized acoustic array which can be used as a low speed towed array or as a static array, horizontally or vertically. It comes in up to 50m connectable lengths, for up to 150m-long towed arrays, and operates down to 300m. It contains SEA’s miniature Integrated Acoustic Sensor (mIAS), a high-sensitivity wideband hydrophone and low-noise pre-amplifier, and micro Non-Acoustic Sensors (µNAS), providing bearing and pitch to ±2deg accuracy, temperature and depth. As well as ASW, it could be used for harbor surveillance, for marine mammal monitoring, environmental monitoring and vessel noise characterization and even condition monitoring. A final proving trial, fully funded by an unmanned defense contractor, were completed earlier this year. Such technologies could help submarines expand their area of influence, says Anstey. But, for many, it’s not so much about the platform any more, it’s about how information from platforms can be integrated and used. 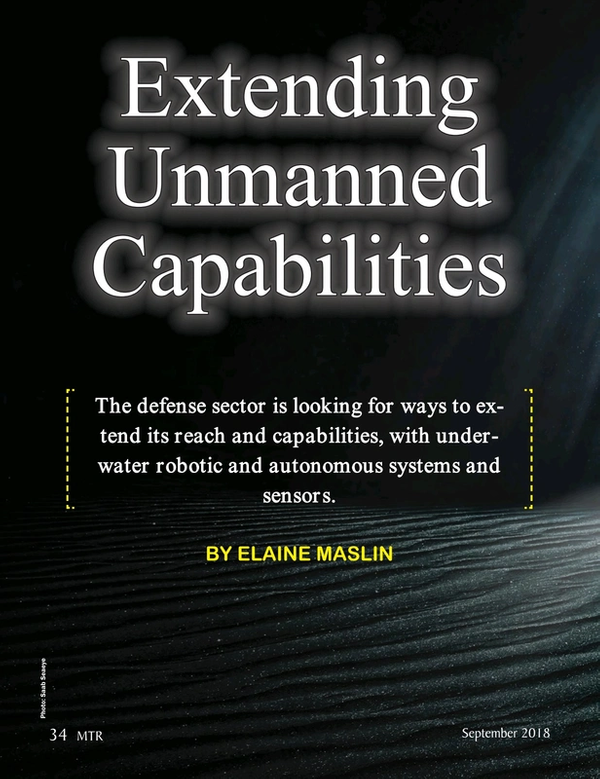 Some think this capability will be what drives dominance in the defense space, from using AI in support of classification to give early warnings of UUVs or torpedoes, obstacle avoidance and target discrimination in a convoy. Versions of Shazzam – the app which can tell you what a piece of music is – and the techniques scientists use to detect stars without data training, were discussed at UDT. Multi-static capability, where multiple sensors are deployed and feed data into one system, to enable greater sensor range and coverage, with fewer false alarms and quicker classification, are the holy grail. But, getting them right is hard and it would mean a degree of open architecture would be needed and sensors that can talk to each other, UDT heard.